After a choppy start to the weak, the Greenback found a bid higher on Tuesday, ignoring weaker PPI data and slumping Empire state mfg survey data. This is likely on counter currency influences, mainly the euro and the Sterling as they both saw selling pressure: the euro on weakening economic data and recession fears, and Sterling on an expected rejection by U.K. Parliament of British PM Theresa May’s Brexit deal with the European Union. Mid-week, we started to see the correlation between USD pairs break down a bit, likely as traders began to focus on pricing in other market themes and news events that pushed the other majors around like housing sales weakness in New Zealand, bullish oil markets lifting the Loonie, rising bond yields putting pressure on the Japanese yen. 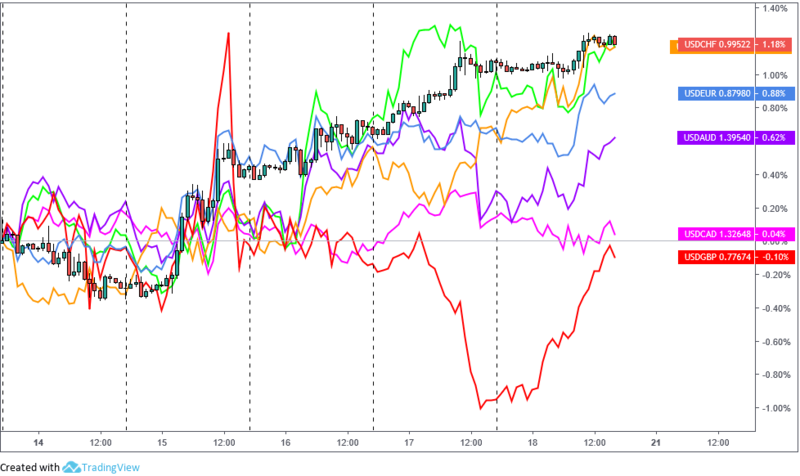 But overall, USD still managed to keep a bullish lean against the other major currencies (with exception to the British pound that rallied on reduced “no-deal” Brexit fears). U.S. economic data was mixed all weak but leading indicators were negative as the Fed’s Beige Book showed concerns mounting among U.S. businesses and consumer sentiment plunges to 90.7 in January versus 98.3 in December. And let’s also not forget the possible pressure on the Greenback from a record U.S. partial government shutdown that is undoubtedly doing damage to the U.S. economy. So it’s likely that the U.S. dollar found support to close out the week strong on traders focusing more on easing U.S.-China trade tensions and headlines like the possible tariff relief on Chinese goods or China’s offer to eliminate its trade imbalance with the U.S. over the next six years.